January 23 is Ed Roberts Day. Roberts is best known as the father of the independent living movement. The California native was paralyzed after contracting polio at age 14. He went on to attend UC Berkeley even though the university had no accommodations for people with severe disabilities. This led to the creation of the Physically Disabled Student’s Program and the Center for Independent Living. 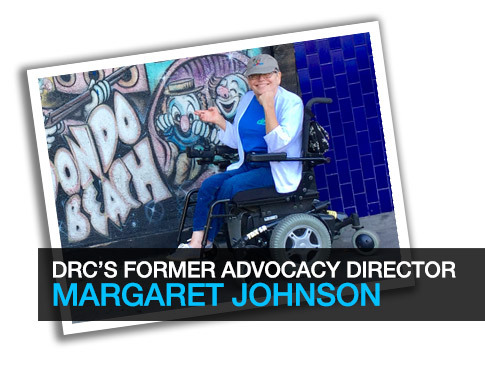 DRC’s former Advocacy Director Margaret Johnson recalls her time with Ed Roberts and shares the meaning of his legacy today. Responses edited for brevity and clarity. How did you meet Ed Roberts? I met Ed through the Center for Independent Living when I first moved to the Bay Area in 1978. He was a fellow person who was post-polio, so we connected because of that. What do you remember about Ed’s activism? He was instrumental in starting the independent living movement and the World Institute on Disability. He was the first person with a disability appointed as the director of the California Department of Rehabilitation. It was a big deal then for a person in a wheelchair to hold that kind of position. In his later years, Ed gave talks to help younger people with disabilities understand that they were equal to people without disabilities and could contribute to society and make a difference. Why is the independent living movement important today? The movement’s focus is on people with disabilities directing and leading their lives as they choose. People with Disabilities lead the independent living movement; non-disabled professionals do not run it. Disability culture is generally the norm at independent living Centers. It is not about charity or doing good for those less fortunate or inspiring anyone. It is about leading lives the same as anyone else in the world without non-disabled interference. Unless you are a person with a disability, it is difficult to understand this distinction. Why should people remember Ed Roberts today? As the father of the independent living movement, he made strides to live life to the fullest and helped non-disabled people understand people with disabilities can and do lead fulfilling, meaningful lives that benefit society. This is still important, as many non-disabled people do not believe people with disabilities are contributing members of society.